Chefchaouen – Abdul’s next desi catch! By my fifth day in Morocco I had already gotten used to the Moroccan shop keepers ‘Nationality Guessing Game’. Every once in a while a shop keeper sitting outside his shop upon seeing me (or for that matter perhaps any other tourist) would uninvited try and guess my Nationality out aloud. ‘India!’, the shop keeper would call out, the most common first guess I would hear as I’d stroll through the streets of the medina. Continuing in my stride I’ll wave my head sideways at each incorrect guess. ‘Spain!’..’Italy!!’..”Brazil!! !” each with a higher pitch and a sense of urgency as the distance between me and their shop grew. Nine out of ten times they would guess Pakistan while I’d be still within earshot; at which I would raise my arm with a thumbs up..
On my last day in Chefchaouen Abdul, a carpet shop owner, sitting outside his shop guessed Pakistan in his first attempt as I passed by his shop on my way to the hostel; I did my customary thumbs up and kept walking. Abdul called out behind me asking if I had a quick minute to translate a message someone had written to him in Urdu. A little curious and surprised as to what he wanted translating I followed him into his shop. He sat me down and told me how he had befriended many people across the globe and that a few of them stayed at his home and some even invited him to stay over with them. I didn’t have any reason suspect that Abdul may slowly be unfurling his sales net around me. So far he had not mentioned anything about carpets at all. I told him politely that I did not have time as I had a bus to catch in 1.5 hrs so if he wanted me to translate something from Urdu to English then he needed to proceed quickly. Going to the back of his shop he came back with a thick register and started showing me messages that numerous people from around the globe had written thanking him for the great deals he had offered them on the carpets they had purchased from him.. Noticing that I was somewhat impressed by the volume of appreciative messages from buyers who all seemed to think they got a brilliant bargain from Abdul, he quickly turned a few more pages over until he came to the message written by a Pakistani couple – Farah and Nabeel visiting from NewYork. They had written a message in English followed by another one in Urdu which was not altogether different from its English counterpart about the carpet they had bought from Abdul at a good price. Abdul sensing that I was feeling a little unamused that he had just called me in to show something for which he virtually already had a translation, called his son over to start unrolling some carpets to show me. I told him I wasn’t interested besides I was back packing and I didn’t have any space to carry even a small rug let alone a carpet. Naturally he had heard this tale from many people whom he had coaxed into buying his rugs and carpets; So he went on telling me about the significance of buying a carpet – from its life long durability, to quoting vague religious references on the importance of buying a gift for one’s mother, to suggesting that I didn’t have to carry it with me as I could post it from the post office (much later I was to find out that posting even a tiny rug the size of a doormat would cost more than the price paid for the rug itself!). 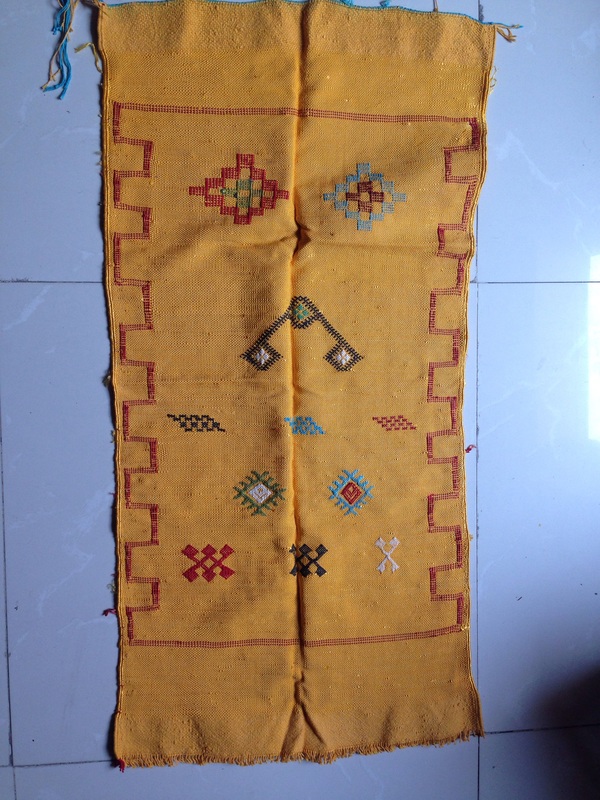 Realising that I would be travelling for four months and anything bigger than a doormat would be a hard-sell he pulled out a few small rugs made of cactus thread. Demonstrating their fire proof quality by trying to light them up with his lighter, the tiny mat size rug looked impressive. He asked me to pick a color that I liked (with no obligation to buy, ofcourse!). Upon telling him that I liked the yellow one he said it was 600 Dhs. I thanked him politely saying that it was outside my budget. Abdul quick to capitalize on yet another novice error asked the price I’d be willing to pay for it. Having no idea how much a rug like that would cost I decided to go for a ridiculously low price, less than half what Abdul had quoted. “250 Dhs”, I said hoping Abdul would realize that I really was not serious about the rug at all and leave me to make my way to the bus station. Abdul declined saying it was too low. At that point I felt that at least I had established that the value of the rug was higher than 250 Dhs, having done this over and over he knew I’d think that too. Abdul went on about how a dinner out in London would cost more than that and offered 350 only because he did not want to bring bad luck to his shop by turning someone away especially not a ‘Muslim brother’, otherwise he would never sell a rug this expensive at such a low price. I rejected his offer hoping that he wont budge and I could take my leave, but Abdul realising that I had fallen for his sales trap hook line and sinker offered 300 Dhs. At that point I was already running too late for my bus, and felt too ashamed to turn a reasonable compromise, to the 250 Dhs I had unwittingly quoted, down. Besides I felt there was no other way to leave his shop with my dignity intact; so I paid him 300 and rolled the tiny mat up. Just as I was leaving Abdul brought his big fat guest book out again and sat me down to write a short message in English and Urdu. 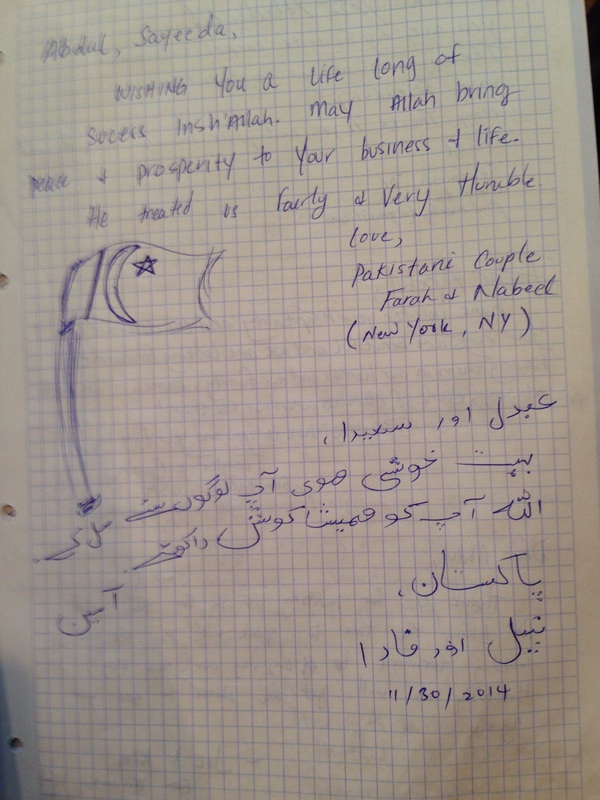 I quickly scribbled a thank you note in both English and Urdu for the amazing bargain Abdul had offered me !?! A little dazzled as to how a leisurely stroll in the medina ended up costing me 300 Dhs! It was only a few seconds after I had stepped out of his shop that the whole episode flashed across my mind.. Soon there will be another unsuspecting Pakistani walking the streets of Chefchaouen who will be asked by Abdul to translate a message from Urdu, this time it would be my hand writing that would serve as a bait for Abdul’s next desi catch! 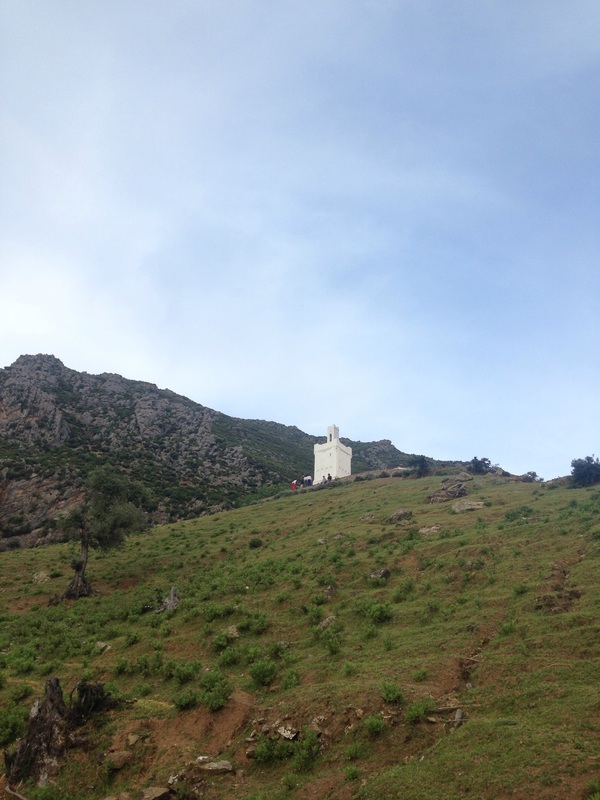 The Spanish mosque sits atop a hill, next to Ras el’Ma river which is used by the local women as a carpet laundry. 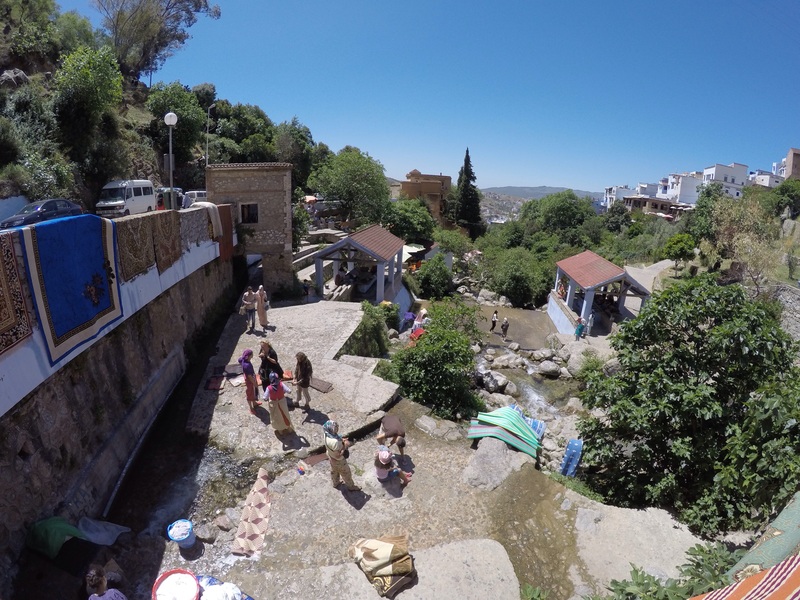 It is about a 30-40 minutes trek from the medina. The mosque itself is abandoned and not used for prayers, but it serves as a very good vantage point to admire the views of the city and its surroundings. Just before sun set on my way back from the Spanish masjid to the medina I stopped near an unmarked trail head, that veered off betwteen two adjacent ridges, with a steep ascent leading into Talassemtane National Park. Waiting there and thinking whether it would be a suitable hike in my joggers, I noticed a flurry of local men who would follow that trail and disappear for 10/15 minutes high up into a bushy patch only to reemerge a few mins later to head back to the city. Curiosity got the better of me and I decided to follow the same track. Soon I heard a shout from further up ahead as a man emerged from the thicket, waved at me and screamed something in Arabic. With my exceptionally primitive vocabulary I couldn’t make out what he was saying and decided to continue. A few minutes later another guy who was making his way behind me caught up and asked where I was headed in a mix of English and Arabic. He wanted to know if I was interested in buying hashish, cocaine or heroine ? I told him I was only here for a hike and wasn’t interested in either. In our combined English/Arabic we exchanged a few more sentences and he asked me where I was from. I told him Pakistan, at which his grin turned into a big smile and said that the heroine the guy up top was selling was from Pakistan! Not feeling particularly proud about it, I told him it must be Afghanistan that he is confusing it with, but he sounded adamant that it came from Pakistan. Not wanting to curb his excitement any further, I let it rest with the thought that it’s probably smuggled from Afghanistan into Pakistan from where it makes its way to North Africa, and decided to steer clear of the busy patch for which one had to veer off the trail. Continuing ahead the view got better and better as I climbed higher. Another 15 mins into the hike I ran into a group of teenagers with their tshirt tied around their heads sitting inside a mini cave heating up something. They weren’t very pleased at seeing me either and shouted something in Arabic at which I responded with a salam and continued my ascent to find a good spot to sit and admire the view. After a while when I came down, a guy sitting close to the start of the trail who spoke perfect English, noticing that I wasn’t a local asked me what I was doing up there and that it wasn’t a good place to venture into. According to him everyone knew about the drug dealing but as long as the activity was outside the city the authorities turned a blind eye to it; And that if I had ventured further on I would have come to big hashish plantations..a part of the National Park to explore on my next trip perhaps..
On Moncefs recommendation we decided to try out Resturant Populaire in Tangier. Not a big fan of sea food I was a little reluctant at first. 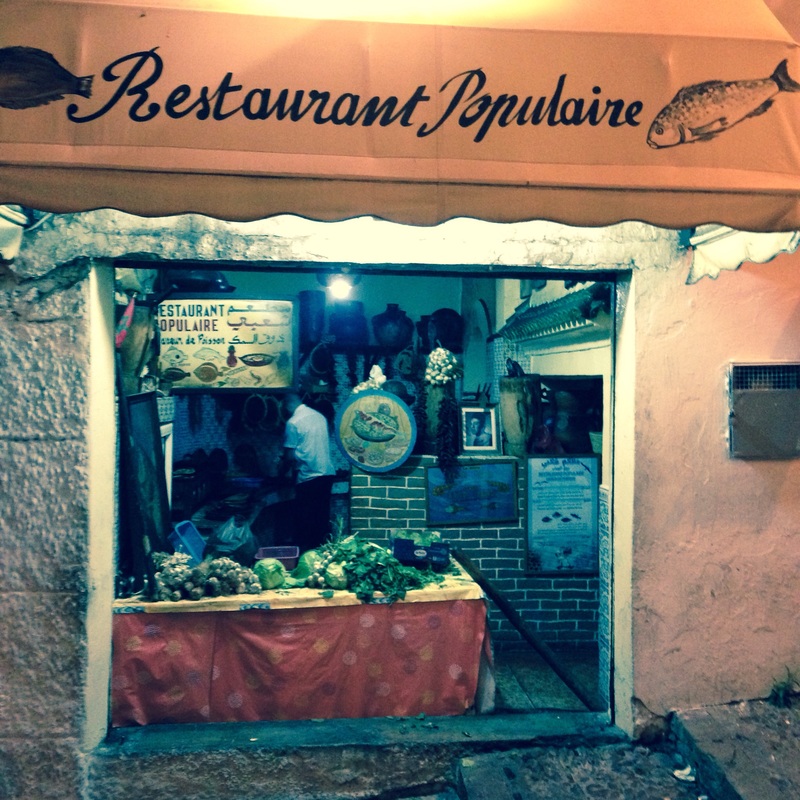 For me the benchmark of a good resturant is that it has to be frequented by locals (and not just ‘tourons’). And this place was teeming with locals! After a 30 mins wait we finally got a seat. Highly recommended for anyone who goes to Tangier. The pictures don’t do justice to what was served. Patience is not my virtue on a hungry stomach, so the table does look like it was hit by a tornado, even though I tried to arrange things a little before taking a few shots (including the picture of a half eaten Cherimoya)..